I was just culling some old photo files and found a copy of an ad from Parks and Recreation magazine in 1921. I had clipped it thinking one day I might find a use for it. Well I already wrote the post I should have put it in — Longfellow Field — about the connection between Minneapolis Steel and Machinery Company and Toro and Toro’s shift from tractor engines to lawn care products. This must be one of the company’s earlier lawn mowers. But I forgot I had this image, so a month after it should have debuted, here it is. 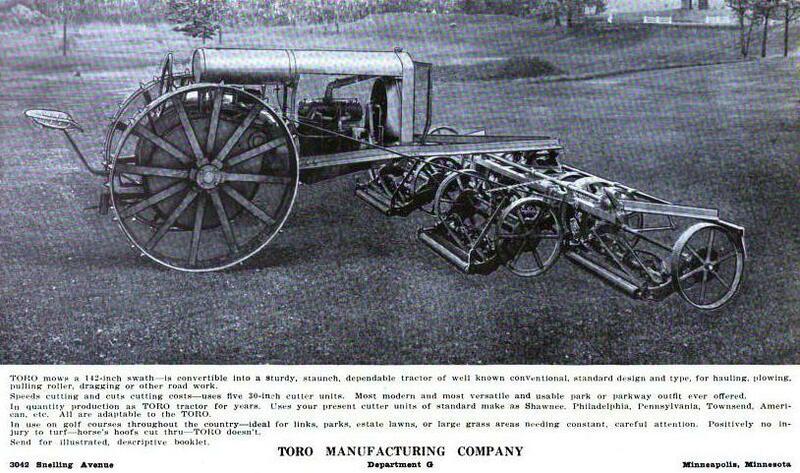 My favorite line in the ad copy is “Positively no injury to turf—horses hoofs cut through—Toro doesn’t.” Although those spikes on the big rear wheels look a bit destructive. Doesn’t offer all the modern-day comforts, does it? Thanks again to Toro for contributing to improved baseball fields in Minneapolis parks. Note: Thanks to Bob Wolff for more history on The Toro Company, posted as a comment on David C. Smith page. Looking more closely at digitized Parks and Recreation magazines to respond to Bob, I discovered that the ad above appeared in 1921, not 1919 as I had originally posted.